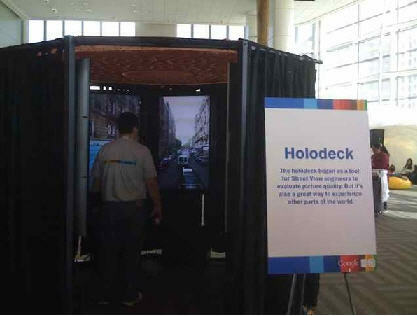 The google holodeck is used by google engineers to test the usability of StreetView photos. It's also a pretty cool tool to use, if you happen to be at the Google I/O conference in San Francisco this year. Google's version of a holodeck is a small room that is equipped with flat panel television displays turned 90 degrees. You stand in the middle and can see an almost completely circular view, based on the Google Street cam pictures available for that location. SF readers are long familiar with the holodeck idea; I have to say that the most noticeable feature of google's implementation is that it is a really warm place to stand. Owing to the heat produced by its seven flat panel screens.